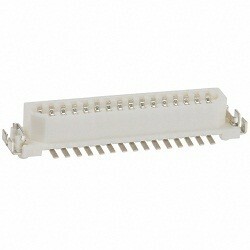 The DF9 Sereis is a VESA and FPDI-1 compliant Board to Board connector. Miniature in size and with a 1 mm pitch, this Board to Board connector is built for designs with limited space such as Liquid Crystal Display systems, Mobile Phones and Note PC's. The DF9 series also features an easy lock mechanism and a trapezoid design which acts as a mis-insertion preventor.